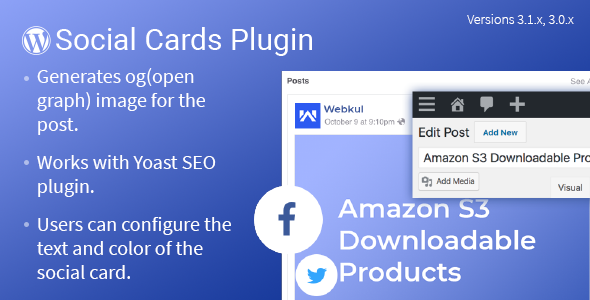 WordPress Social Cards plugin enables the user to generate OG (open graph) images for their posts which they want to share on Facebook and Twitter so that when the users share their posts so a post image will get generated for their post showing the related content of the post in a much more effective way which basically attracts more users towards your post. The plugin generates og(open graph) images for the posts which users wants to share on their Facebook or Twitter account. Works with Yoast SEO plugin. Admin can configure the background color and text for the og(open graph) image generated by the plugin. Admin can view the sample of the generated image to be used as the social card for their posts.